But I couldn’t resist ordering the garlic and green onion hummus appetizer when I went out to dinner last night. And the wild mushroom soup with roasted garlic was definitely calling my name. Needless to say, I may have offended a few patients this morning when my garlic and onion infused breath hit their olfactory senses. On the other hand, my garlicky breath gave me an opportunity to talk about these pungent root vegetables. And most patients were amazed at the phenomenal health benefits they offer. Sure, I told them. They’ll give you bad breath. But it’s definitely worth it. That’s because these vegetables, collectively known as alliums, all contain high amounts of sulfur compounds that have a wonderful effect on your health. And seriously… who wouldn’t be willing to smell a little worse if it could potentially preserve your health and extend your life? One of the greatest benefits these stinky vegetables have to offer is cancer protection. And they work on several fronts to do this. They appear to block the activation and formation of cancer-causing substances. In other words, they may halt the initiation of cancer. Many of the compounds in alliums have the ability to suppress the spread of cancer cells, and actually kill them off. The sulfur compounds in allium vegetables may enhance DNA repair capacity. With all of these cancer protective properties, it’s no wonder people who eat the most of them reduce their chances of several types of cancer. This includes cancers of the stomach, colon, prostate, breast, pancreas and esophagus. Allium vegetables are also great for your cardiovascular health. Garlic, in particular, is something I recommend for all of my patients with – or at risk of – heart disease. The active compounds in garlic help keep your blood cells from sticking together. 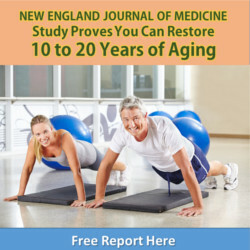 This means improved blood flow and less chance of clotting. They also help to prevent oxidation of LDL cholesterol, lower blood pressure, reduce arterial plaque and protect against free radical damage. Adding other alliums like onions and leeks can only help matters. In fact, higher intakes of garlic and onions are associated with about a 64% reduced risk of cardiovascular disease. Additionally, eating these foods can cut your chances of chronic kidney disease by almost a third. And they can reduce the onset of high blood pressure by around 25%. Plus all of these foods help ward off osteoarthritis. They work by suppressing the production of something called metalloproteinases. These are enzymes that cause irreversible damage to bone, cartilage and other connective tissue. So the sooner you can stop the process, the more mobile you will remain. To get the most out of your alliums, it’s best to crush or chop them. This releases the sulfur compounds that are so good for you. Then, add chopped onion, garlic, leek, shallot and chives to your salads. Mix them in raw with your salad dressing. Use them as a starter for your favorite dishes by slowly sautéing them in extra virgin olive oil. Add them to soups, stews, sauces, marinades and anywhere else they make sense. Every time you eat them, you have the potential to add years of healthy living to your life. So who cares if your breath smells? It won’t bother me a bit! Nicastro HL, et al. 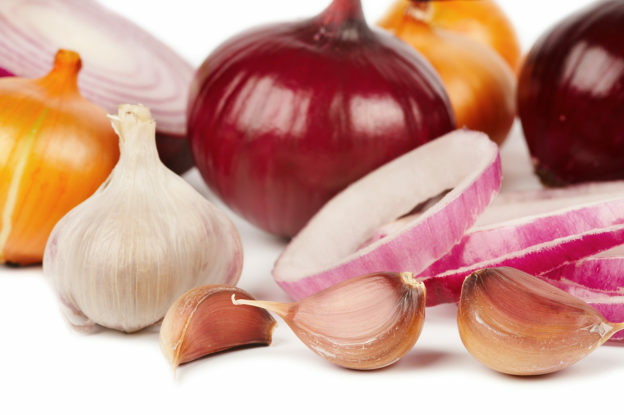 Garlic and onions: Their cancer prevention properties. Cancer Prev Res (Phila). 2015 Mar; 8(3): 181–189. Garlic and Cancer Prevention. National Cancer Institute. Ritchey JD, et al. Genetic variants of DNA repair genes and prostate cancer: a population-based study. Cancer Epidemiol Biomarkers Prev. 2005 Jul;14(7):1703-9. Khatua TN, et al. Garlic and cardioprotection: insights into the molecular mechanisms. Can J Physiol Pharmacol. 2013 Jun;91(6):448-58. Bahadoran Z, et al. Allium vegetable intakes and the incidence of cardiovascular disease, hypertension, chronic kidney disease, and type 2 diabetes in adults: a longitudinal follow-up study. J Hypertens. 2017 Sep;35(9):1909-1916. Williams FM, et al. Dietary garlic and hip osteoarthritis: evidence of a protective effect and putative mechanism of action. BMC Musculoskelet Disord. 2010 Dec 8;11:280. Murphy G, et al. What are the roles of metalloproteinases in cartilage and bone damage? Ann Rheum Dis. 2005 Nov; 64(Suppl 4): iv44–iv47.